I admit that early on in my yoga life, I wasn’t much of a restorative yogi. I tried a few restorative classes, but I was put off by the elaborate setups for each pose, which I felt stole minutes from my “naps” and taxed my mind with the (for me!) terrible task of spatial reasoning (I thank all the yoga teachers over the years who patiently untangled me from straps). Each new setup created anxiety in me: Will I be the only one who builds this next pose all wrong? As I slowly became familiar with the architecture of the most frequently taught restorative poses, I got over my grumpiness and learned to love practicing restorative yoga with as many props as possible. Still, when I became a yoga teacher, I shrank from teaching restorative yoga, daunted by the prospect of talking groups of people into building the poses I’d come to love. When I finally began teaching restorative classes, the solution I gradually arrived at was to create an extremely simple setup—the one I’m sharing here—and to use that setup for all the poses in a sequence. This setup is still my go-to. 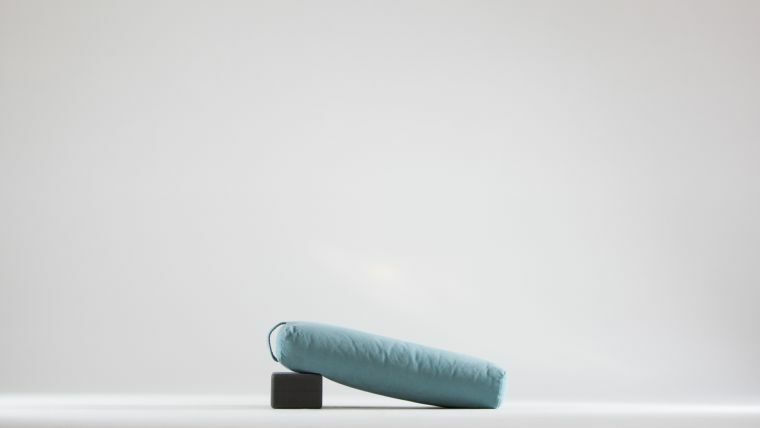 It’s especially helpful when teaching students who are newer to restorative yoga, when teaching large groups, and when teaching or practicing somewhere that might not have a vast storehouse of yoga props (like a gym or your own home, for example). I’ve come to believe that the support of one firm bolster is enough to allow many of us to let go after a long day. I admit that a pared-down prop arrangement may not be as relaxing as a more bounteous one (and I do suggest additional prop options below for those with the time, energy, and props to spare), but I’ve come to believe that the support of one firm bolster is enough to allow many of us to let go after a long day. I also feel that many students appreciate easy transitions that don’t interrupt their bliss too much even more than they might appreciate additional prop support. The following restorative yoga practice aims to minimize construction time and maximize relaxation time. You can do it as an entire sequence, or simply draw from it as you’d like. For all of the poses below, you’ll need an inclined bolster slanting up toward the back of your mat. Keep in mind that there’s more than one way to incline your bolster. Try any of the three options below, depending on which props are available. Inclined Bolster Version 1: If your bolster is firm, simply place a block on its flattest setting horizontally across the back of your mat, and tip one of the short ends of your bolster up on it (so that the highest point of the inclined bolster is at the back of the mat). 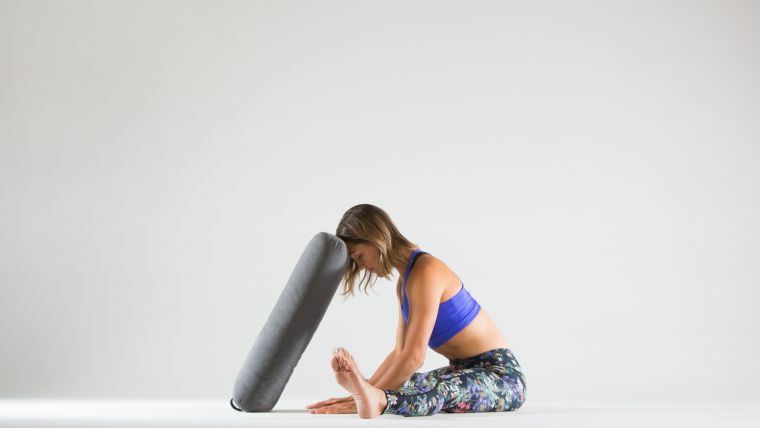 If your bolster is thin and soft, like the one shown here, you may want to add a folded blanket on top for additional support in some or all of the poses below. Inclined Bolster Version 2: If you don’t have a bolster, fold two blankets into long rectangles, and lay one on top of the other to create a makeshift bolster. Two blocks are helpful to prevent the blankets from sagging. Place one block (at its middle setting) horizontally at the very back of your mat. In front of it, place a block on its flattest setting. Inclined Bolster Version 3: Place one bolster horizontally near the back of the mat. Place another bolster lengthwise along the mat, resting one of its short ends on the horizontal bolster to create a slant-board effect. Sit facing the front of your mat, with your legs extended and your sacrum against the base of the inclined bolster, which ideally supports the inward curve of your lower back. Lie back over the inclined bolster. Bend your right knee and let it fall open to the side, bringing your right foot to the inside of your left thigh. Drape your arms out to the sides as you would for savasana, palms facing up. After a few minutes here, repeat on the left side. If you feel any strain in your right hip or inner thigh, you can also place a bolster or folded blanket underneath your right thigh (near your right hip). And you may want to place blankets under the backs of your hands and forearms if your knuckles are weighing heavily against a hard floor, or if the backs of your wrists don’t drop down easily toward the floor. While reclining on the bolster, bend your knees and widen them away from each other, bringing the soles of your feet to touch. (Your feet can be as close to you or as far forward toward the front of the mat as you’d like.) Stay here for several minutes. Want more props? Place a blanket under your head if you’re feeling discomfort in your neck. Place blankets, bolsters, or blocks under the knees or thighs near the hips (especially if your outer hips or inner thighs are feeling any strain). Consider placing blankets under the backs of your hands and forearms. You can also make a big loop with a strap, slip it over your head, and situate it against your sacrum. Draw it inside your thighs, and loop it around your feet. Pull the strap just tight enough that you feel a gentle hug. The strap will encourage a slight anterior (forward) tilt of your pelvis, as well as keep your feet together. While still reclining on the bolster, bend your knees and place the soles of your feet on the mat about shoulder-distance apart. Windshield-wiper your legs a few times from side to side, and then relax both knees over to the right. Stay there for a few minutes, and then repeat on the left. Want more props? Place a blanket under your head if your neck is uncomfortable. Place blankets or a bolster on the floor to the right to support the weight of your legs in the twist, and/or place a blanket between your legs to support the weight of the top leg. Support the forearms and hands with blankets. From a reclining position on the bolster, simply extend your legs and linger here for several minutes. Want more props? If your neck is uncomfortable, place a blanket under your head. Place another rolled-up blanket (or bolster) under your knees for additional comfort. To encourage neutral rotation of the legs, loop a strap around your ankles to keep your feet together, toes pointing up. Place blankets under your hands and forearms. From a reclining position on your bolster with your legs straight out in front of you, move your right foot a few inches to the right. Cross your left ankle over your right. Keep your arms alongside your body, or interlace your hands behind your head for part or all of your time in this pose. You might arc your upper body over to the right slightly—just as far as your bolster (and your comfort) will allow. After a few minutes here, repeat on the left side. Want more props? Place a blanket under your head if you feel any tension in your neck. If your arms are alongside your body, place blankets under your forearms and hands. Come to all fours facing the front of your mat with your knees close to the bottom of the bolster, and then slowly lower your belly to the floor. 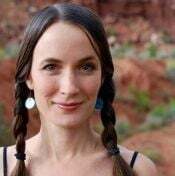 Take your shins and feet up the inclined bolster and stack your hands to make a pillow for your forehead. (For a bigger backbend, start with your pelvis close to the bolster so that your thighs as well as knees and shins are elevated.) Hold here for several minutes, noticing how every exhale draws the belly away from the mat, in toward the spine. Want more props? Place a blanket under your pelvis if your hip bones are digging into the mat. You could also place a looped strap around your ankles to hold your feet together. If you’d like to stretch your arms behind you, as you would in an active locust pose, place a blanket or two under your forehead (giving you room to breathe comfortably through your nose) and a block under each shoulder for a gentle lift. Sit upright with your left hip flush against the base of the bolster, and your knees bent and pointing to the left. 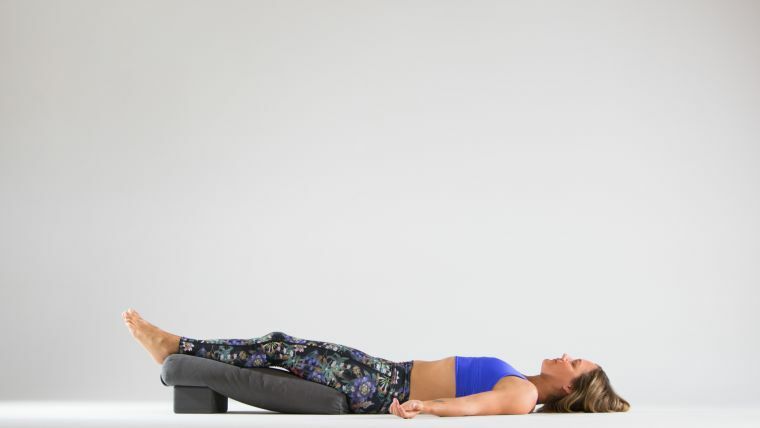 Bring your hands to either side of the bolster, turn your torso toward the bolster, and slowly lower down, bringing as much of your chest onto the bolster as possible. Hug the bolster or rest your hands and forearms on either side of the bolster. Turn your head in whichever direction feels good to you: Turning away from your bent knees will increase the twist, while looking in the direction your knees are pointing makes for less intensity. Hold here for a few minutes, then repeat this twist on the other side. Want more props? Try placing a blanket on the floor under your left knee, and/or between your legs to support the weight of the top leg. Kneel facing the bolster, and then separate your knees so that you’re straddling the base of the bolster. Fold forward, lowering your chest to the bolster, and keeping your sitting bones on (or near) your heels. Hug the bolster or place your hands and forearms alongside it. Turn your head to one side. Stay here for several minutes. Halfway through the pose, turn your head to the other side. Want more props? If the floor is hard, or your knees are sensitive, you might appreciate a blanket under your knees. A folded blanket behind the knees (smooth edge against the knee crease), draped over your calves and heels, can prevent the knees from flexing as deeply and create a softer seat. Sit upright, facing and straddling the bolster, with your legs fairly straight and about 90 degrees apart. Fold forward, bringing your chest to the bolster. Stack your hands to create a pillow for your forehead or rest your forearms and hands on the floor and turn your head to one side. If your head is turned to one side, halfway through the pose turn it to the other side. Want more props? To make the forward fold more accessible, you could sit up on a blanket (or two), and fold with bent knees (placing a rolled-up blanket or block under each knee for support). If your heels are uncomfortable, pad them with blankets as well. If your hands make for a bony pillow, or your forehead doesn’t reach them easily, rest your forehead instead on a folded blanket. 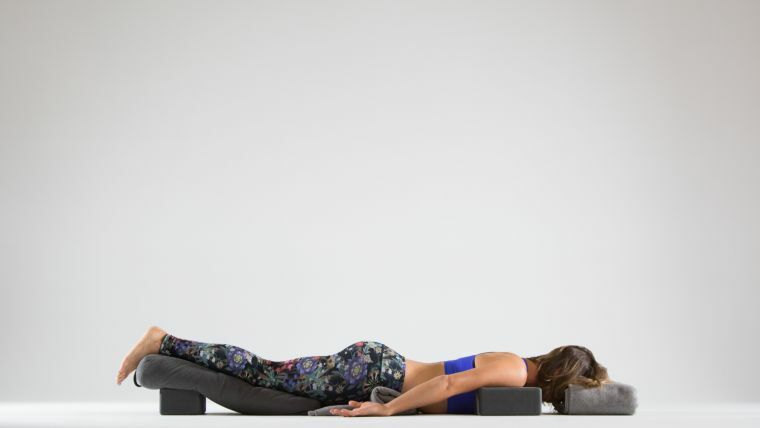 If your hamstrings are too tight to allow you to reach the bolster comfortably, temporarily dismantle your bolster ramp: Set the bolster up like a vertical column (or leaning tower), and rest your forehead against the top of it as you fold forward just a few degrees. Of course, you are also welcome to skip this one and simply proceed to the next pose! Lie down on your back with your head at the front of your mat. Scoot slightly to the left side of your mat, and place just your right leg on the inclined bolster. Place your left leg on the mat alongside the bolster. Drape your arms alongside your body, palms facing up, or rest your hands on your belly. Stay here for a few minutes, then repeat with your other leg lifted. Want more props? Place a blanket under your head if your neck is uncomfortable. If your arms are draped alongside your body, support your forearms and hands with blankets. Place a folded blanket, bolster, or block on either side of your head, right against your ears, to keep your head from turning and to block some sound. Starting from a reclining position with both legs up on the bolster, cross your left leg over the right and bend your knees, bringing your feet to the floor on either side of the bolster. Rest your hands on your belly or drape them alongside your body. Rest here for a couple of minutes, and then repeat on the other side. Want more props? If your neck is uncomfortable, place a pillow under your head. Try hugging a bolster or a blanket (folded into a long rectangle) placed lengthwise on your torso. For the final pose, lie down on your back, bringing both legs onto the bolster lengthwise. Drape your arms alongside your body or rest your hands on your belly. Want more props? If your neck is uncomfortable, place a blanket under your head for a pillow. Otherwise, place blankets, bolsters, or blocks on either side of your head to keep it from turning and to block out sound. Consider draping an unfolded blanket over the bolster, and then wrapping your legs up in that blanket—to keep both legs effortlessly on the bolster and to give you the feeling of being safely swaddled. 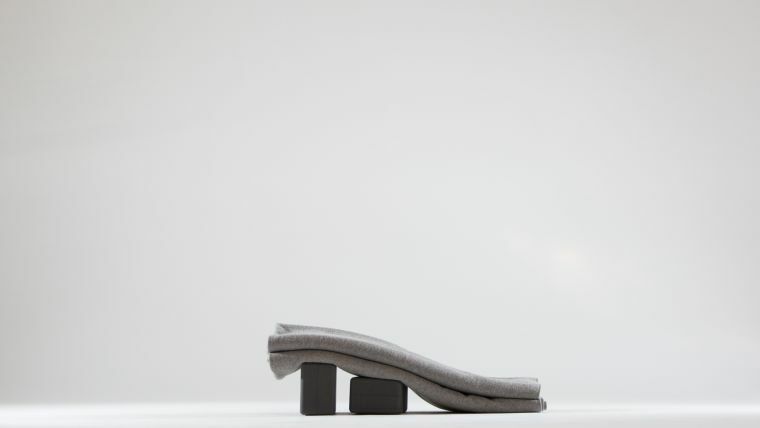 Alternatively, loop a strap around your ankles to keep your feet on the bolster. If your arms are alongside your body, feel free to support your hands and forearms with blankets. 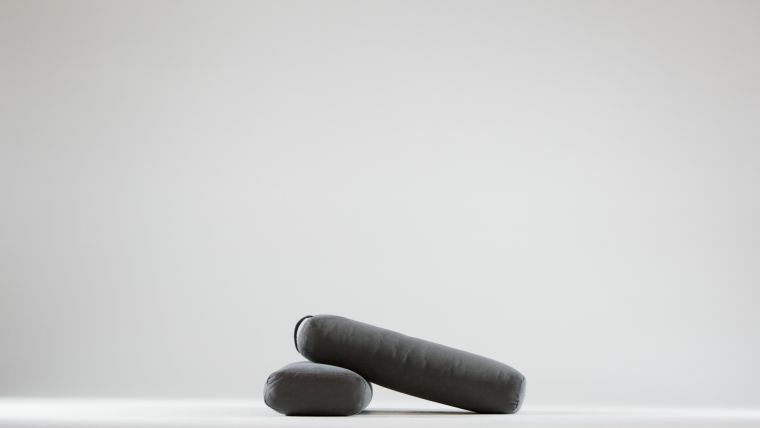 Notice if you feel more restored after a practice that required little bolster movement, in which you simply moved yourself in relation to the bolster. Are there other parts of your life that you thought were in need of drastic rearrangement? You might allow those aspects of your life to remain fixed while you adjust your own relationship to them—approaching them from a different direction to yield a new world of possibilities.